Enjoy one of Namibia's most iconic landscapes on a 3-day tour from Windhoek. Depart from the country's capital en route to Sossusvlei, a part of the Namib Desert that's home to some of the world's largest sand dunes. 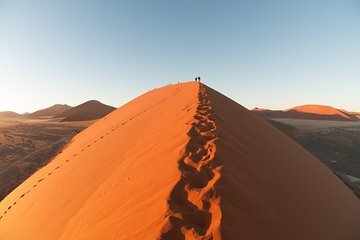 View these spectacular orange and red formations at dawn, then spend a day exploring more of the conservation area including its large salt pan and Dune 45, said to be the planet's most photographed sand dune. This thrilling multi-day tour comes with meals, camping equipment and the expertise of a professional guide.